Oh! He's hugging her shoulders. Her shoulders?! He's not touching her bottom? 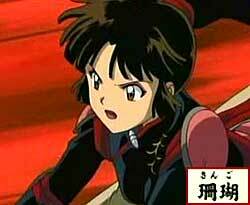 Sango, is it okay for me to be here? I don't want you to suffer alone. Is there anything I can do? For now... just stay beside me. Keh. What does Miroku have besides his indecency? He's got the Wind Tunnel! "What is this horrible feeling...?" This is one of the rare episodes that uses first-person perspective in some shots. It also makes use of the 'shaky camera' technique. It also uses a 'sepia color tone' approach to flashbacks, like in old films. 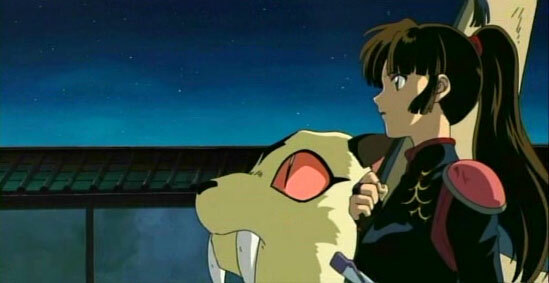 KAG: At the castle where Naraku's baby sleeps, Sango reunites with Kohaku. Painful memories and heartbreaks start to resurface. When I met Kikyo again, her body is not fully healed yet. Don't force yourself, just wait here! Then... give this arrow to Kagome. Whether she make good use of this, it's up to her. This arrow that Kikyo gave me... why? Princess Abi and her mother, who are in opposition with Naraku, finally opened the way to the boundary between this world and the next. Next on Inuyasha, "The Demon that Links to the Next World". Break the barrier and thwart Naraku's trap...!